The Haier HVTM06ABS 6-Bottle Wine Cellar has a compact design that is perfect for people with a limited amount of space, or for someone that wants to keep a small wine cooler on their countertop. It has a 6 bottle capacity and it will keep your wine at the optimal drinking temperature. The Haier 6-Bottle Wine Cellar features a double pane insulated glass door and it has an adjustable, digital thermostat so you can control the temperature very easily. Inside the cooler are two, fullwidth, chrome wire storage racks. This wine cooler also uses a thermoelectric cooling system so it operates without any vibrations and it makes very little noise. 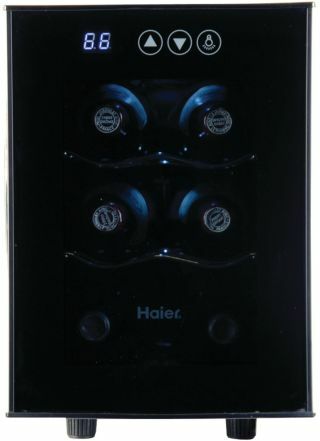 When researching the Haier HVTM06ABS 6-Bottle Wine Cellar we found it for sale at a number of different retailers but the only website that had any customer reviews was Amazon.com. At the time of this writing, there were 27 customer reviews and it received an average user rating of 4.7 out of a possible 5 stars; a very impressive user rating. Most customers are saying that the Haier 6-Bottle Wine Cellar is a very attractive unit and it is also very easy to use. It is ready to go right out of the box. All you need to do is take it out and plug it in and it will begin cooling right away. The digital controls make selecting the right temperature very easy. This wine cooler has a blue LED light that you can leave on if you want to show off your wine but you also have the option of turning the interior light off. The racks inside this wine cooler are designed for standard sized wine bottles but one customer points out that you can put unusually shaped bottles in this cooler as well. He said that he puts champagne bottles on the bottom of the unit and they fit just fine. An average user rating of 4.7 out of 5 stars is very impressive and the only complaints we found for this wine cooler were complaints about noise. One customer said that if they knew how loud the interior fan would be they wouldn’t have purchased it. However, most customers are saying exactly the opposite and they are commenting on how quiet this cooler is. One customer said that they can’t even hear the cooler over the sound of their air conditioner. This cooler is certainly quieter than any cooler or refrigerator that uses a compressor. The noise is only noticeable if you are right next to the cooler. Most of the reviews for the Haier 6-Bottle Wine Cellar are very positive and with such a high percentage of positive ratings, it’s clear that this wine cooler would be a great choice for anyone that needs a nice, compact unit. We can’t argue with all of the happy customers and we would certainly give the Haier 6-Bottle Wine Cellar our recommendation.